The U Klenotnika - Jewel Hotel is a charming family hotel in the very centre of Prague .The hotel is situated in a historical building in a lovely quiet street and is just a one minute walk away from Wenceslas Square and 3 minute walk away from the Old Town Square .The hotel offers pleasant and quiet accommodation in 11 rooms and a large breakfastbuffet ,which is served in a beautifully decorated restaurant. There is free wireless internet connection throughout the hotel , one computer at our guests disposal in the lobby ( for free ) .Friendly staff will gladly advise you 24 hours per day. Parking available just in front of the hotel. All rooms are newly renovated and have a bathroom with a shower, Satellite TV, telephone, air conditioning ,mini-fridge , hairdryer,free Wi-Fi connection. Nearby there are many music clubs , a wide selection of restaurants as well as plenty of coffee-houses. 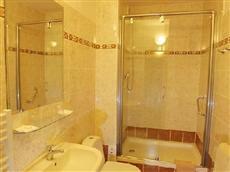 Hotel is close to all major public transport links. All main historical sights within walking distance.